Many Days, Our Tour Goes to Both Destinations! (On These Days, the Lunch is NOT Included, but can be Purchased from a Delicious Menu with Sandwiches, Wraps, and Local Favorites. The Tour is also Extended by 2 Hours to Give you Enough Time at Each Location! Please Call for Most Up-To-Date Schedules! If you are looking for an adventure that takes you beyond the surface of Freeport's coastline, sign up for this thrilling excursion into the interior of Grand Bahama Island. You can hop into your own jeep and follow an expert guide for some off-roading fun into the center of the island. Along the way, you will encounter countless plant species and breathtaking views of the Caribbean. This tour mixes an exhilarating ride with deep insight into the mixture of ecosystems that make up the tropical paradise of this amazing island. As you drive along the coastal path in your open air jeep, you watch the clear blue water and sandy shore give way to evergreen forest. The trail snakes up into the hilly interior until you reach the sight of Grand Bahama Island's unique natural wonder the mesmerizing inland blue hole. From there, you can return to the shore to relax on the beach and sample some delicious local fare. After crossing Freeport's famous Casuarina Bridge, your jeep convoy will take you to another beautiful beach where you can enjoy the tranquility of the Caribbean's clear waters and white sand. Included in your safari is a visit to the Lucayan National Park where you will encounter a fascinating underwater cave system, one of the largest in the world. The park also consists of several diverse ecosystems, including pine forest, blackland coppice, rocky coppice, mangrove swamp, whiteland coppice, and shoreline. You can end your adventure with some shopping at a local crafts market or with some more beachside relaxation. On this tour, your guide will bring you to some of the most remote areas of Grand Bahama Island and enrich your understanding of its natural wonders. This is a great opportunity for families or anyone interested in nature to really take in all the island has to offer. Is lunch provided on this tour? Yes, a light lunch is provided on this tour for the 5-hour one-destination days. On the days we go to both destinations, lunch is NOT provided but can be purchased. Who is responsible for driving the jeep? You will drive your own 4X4 open top jeep in a convoy, led by an experienced island guide. Is hotel pick up included in the cost of the trip? Yes, hotel pick up is provided at no charge on this trip. 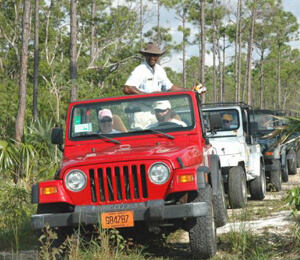 I have been to the Bahamas many times, but Grand Bahama Island Jeep Safari Tour is one of my favorite trips! It includes everything that everyone should do here. As a Bahamas veteran, I can say only the best about this experience!